Great news, everyone! I just upgraded my Zune HD‘s firmware to the latest and greatest version, version 4.5, and I’m here to report that everything went smoothly… mostly. I probably shouldn’t have used the word “everything,” then. I can now play Xvid videos just fine, having tested an old SummerSlam 2001 DVD rip that I had in my Zune video folder. (Why I have old WWE DVD rips on my hard drive is a matter for another day.) So no problems whatsoever in that regard. Smart DJ, on the other hand, seems just OK. You touch the little icon and off the Zune goes, trying to find similar artists and genres based on your current artist selection. The thing is, the results are sorta lackluster. Like, I’ll activate Smart DJ when looking at Pearl Jam, and it’ll throw back other songs from the same album, or merely other Pearl Jam songs from different albums. Same thing goes with Jay-Z. I thought the point was new music discovery? Or, even more weird (but in a different way), I’ll activate Smart DJ while looking at Ladytron and it’ll create a playlist including Wu-Tang Clan. What do Ladytron and Wu-Tang have in common? Unless I missed some sort of experimental phase of the Wu-Tang Clan, I’m gonna say they don’t have very much in common! It’s not always like that—I’ll pick Yeah Yeah Yeahs and it’ll make a playlist including Phoenix. That at least makes sense—it’s all indie rock nonsense. Presumably Smart DJ improves the more music you have on your Zune HD, and since I only have a 16GB version… Good thing there’s a 64GB version! So, video playback works splendidly, but Smart DJ is a little iffy. The feature I’d like to see most, especially if Microsoft is pushing the Zune HD as a “higher end” media player? FLAC playback. Surely if the Zune HD can handle Xvid playback it can handle FLAC playback, right? Update I probably should have mentioned that I don’t have Zune Pass. 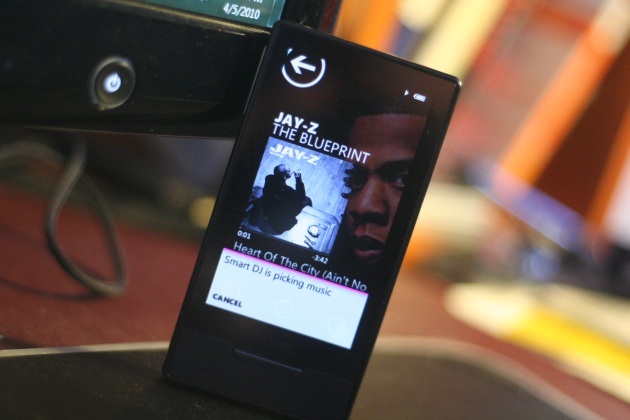 I would imagine Smart DJ would work quite a bit better if it’s able to tap into the Zune Marketplace rather than merely a local library. I can only test what I have, so if anyone out there in Radio Land has Zune Pass be sure to let us know how you find Smart DJ. To be honest, I primarily use my Zune HD to listen to podcasts on the train, so Smart DJ is wasted on people like me. Still, it’s filled to the brim with music (I only keep the most recent podcast on there at all time, out of say five podcasts) and that’s how it worked for me. Your results may vary, etc.